If you’re drowning in debt, it can be extremely easy to get caught up in negative feelings and a “woe is me” thought process. Debt seems like it can be forever, but really, it’s not. It can be paid off, all at once or in slow increments if you stay on top of things. 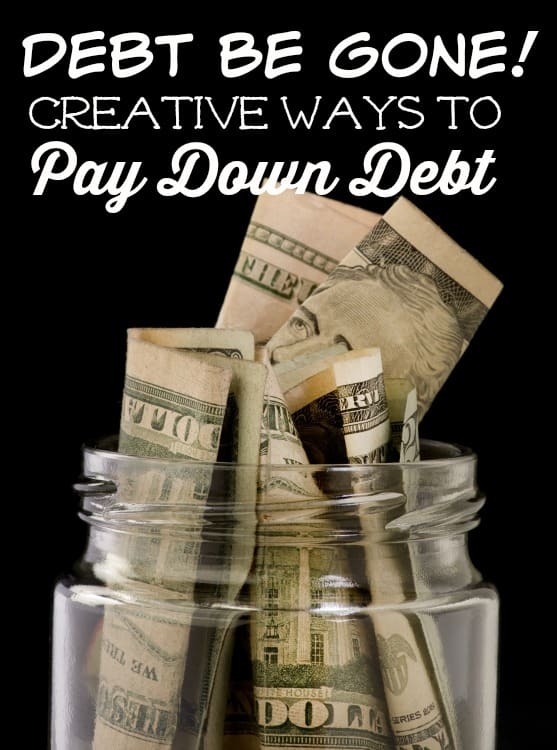 If you’re stuck on ways to pay down your debt, these creative ways to pay down debt will help. They may not be for everyone, but they will help. One fantastic way to pay off debt is to use your phone and computer to make money. I personally make over $225.00 per month this exact way. In this post HERE, I give you my process step by step so that you can do it too. Another thing you might want to consider is finding a hobby that you love to do and then starting a blog on it. Blogging can be very profitable and is something you can do at home. HERE I tell you how to start a blog in just 3 easy steps walking you through the first few steps to get your blog live. The biggest “key” to paying down debt is to do it with a snowball effect which, if you’re big into being debt free, you’ll likely know is a concept taught by Dave Ramsey. Imagine that you are rolling a snowball. It starts out small, but as you continue to roll it, it picks up more and more snow making it grow larger. Paying your debt down should be looked at the exact same way. Basically, little payments thrown at it in a quick manner. Then, when you pay off one debt, take those payments and add them to your next largest debt and so on. Eventually, your little payments will turn into big payments and you’ll be rolling just like a snowball down a hill. These ideas won’t pay your entire debt amount off, but they will help you start the snowball. Put the Shopping You Do to Work for You – Do you shop at all? I’m sure you do since most of us have to. One very easy way to pay down debt is by putting your shopping to work for you. I frequently buy groceries for free (you can see how in THIS post) on Amazon or Target’s websites and when I do, I always make sure that I shop through Ebates. Why? Because it gets a little bit of my own cash put back in my pocket just for shopping through them. Cash back in my pocket is always a good thing and is great for throwing little payments at your debt. Help Others Find Deals and Earn a Paycheck Doing It – Sears and Kmart have an awesome program called Shop Your Way Rewards. This works for you and can help you pay down your debt because you can sign up to be a personal shopper. You would help others find great deals and earn a commission off of their purchases! Collect scrap metal – If you live in an area where scrap can fetch a good price, place ads on Facebook groups and Craigslist looking for people who are wanting to get rid of it. You’ll go pick it up and cash it in to earn a bit of extra cash. Pop cans can also be included in this too if your local recycling center pays for them. Have a yard sale – Yard sales can be very, very profitable if you know how to plan your sale correctly. Clean out your clutter and have a yard sale to help pay down some of your debt. Do yard work – While it may not be the most glamourous, doing yard work can net you a tidy amount of cash each month. Put the whole family to work and mow, weed and rake till your heart is content. Resell – Thrift stores and yard sales are gold mines for good deals. Head out to do some shopping and then use Ebay, Craigslist and other sites to sell your finds for more than you paid. Just be sure to keep your prices reasonable. If you’re looking to start your own online store, Shopify has a great platform with plans as low as $9.00 per month. For $29.00/mo they will give you your own website to sell on as well. Apps and surveys – They may seem pointless, but you can earn a nice, tidy amount from surveys and apps each month. Use them to earn that extra cash and turn them into debt snowballs. I personally add $225.00 a month to my income just by using them. I like having the extra to use to buy groceries with or to invest or save for retirement. Sell baked goods – Your local school has bake sales so why shouldn’t you? Facebook groups are full of folks that are making a few extra bucks by selling baked goods. If there’s a dish that you’re particularly good at making, give it a whirl. You never know how people will react and you may just find yourself with a steady side business. Use your coupons to pay down debt – If you coupon, you’re likely saving quite a bit of money each time you shop. Throw that money at a small debt you have and you’ll have it paid off in no time. Like I said earlier in the post, you won’t make pay off all of your debt with these ideas, but you will be able to make slow and steady payments with them and as we all know, slow and steady wins the race. The ideas above could easily pay off over a thousand dollars a year if you really worked at it.